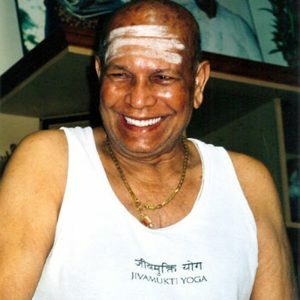 Sri K. Pattabhi Jois studied yoga under his guru Sri Krishnamacharya and also attended the Sanskrit College of Mysore, where he became a professor of Sanskrit and Advaita Vedanta. He and Sri Krishnamacharya developed the Ashtanga Yoga vinyasa series based on the purifying practices described in the ancient texts, which they discovered. In 1948, he founded the Ashtanga Yoga Research Institute in Mysore. In 1958, he wrote his classic book Yoga Mala, which outlines Ashtanga Yoga and explores yoga philosophy. Sri K. Pattabhi Jois lived as a householder, meaning he had a wife and family. By means of his sadhana, he was able to live in the material, secular world while at the same time being free of the usual emotional ups and downs that plague ordinary people. Sri K. Pattabhi Jois taught Sharon and David, among many important things, the power of hands-on assists in transmitting the nuances involved in the practice of asana, as well as the importance of developing and maintaining a high intention during the practice of yoga. In 1998, David was made a certified Ashtanga Yoga teacher by Sri K. Pattabhi Jois.